Less than a year after Brexit, Nigel Farage and Arron Banks are ready for a new independence push on the other side of the Atlantic. 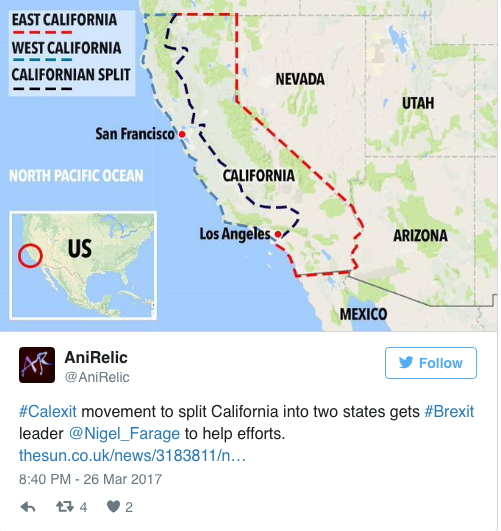 The pair are throwing their weight behind 'Calexit', a campaign to cut California in two and create a new pro-Republican political entity in the east of the current state, receptive to their US ally Donald Trump. The self-styled 'bad boys of Brexit' have reportedly raised $1 million to help the Calexit push, and Banks is now talking about pitting "Hollywood elites versus the people" and "breaking up the bad government." It's the sort of rhetoric with which British Remainers will certainly be familiar. On the face of it, Banks and Farage's intervention is ideally timed. These two highly skilled political operators have joined the debate at a time when California is awash with support for independence, largely catalysed by Mr Trump's shock election victory last November. But if the dynamic duo think their entry into Californian politics will be well-received by the separatists, they might want to think again. For many Californians who support independence hold views diametrically opposed to those of Farage and Banks. Far from supporting Donald Trump, they are repulsed by him, and view political change as a way of hurting the new president, not abetting him. The most vocal group on this subject is Yes California, a movement which reached its apogee in the immediate aftermath of Mr Trump's election victory. Founders Louis Marinelli and Marcus Ruiz Evans don't want to split California in two; they want to rip out the entire state and create an entirely new country, founded on the sort of principles espoused by the hippies of 1960s San Francisco - and which are anathema to Mr Trump and his British devotees. On their website, Yes California's founders say they want to cut military spending, help the environment, welcome immigrants and create state-sponsored healthcare programmes. Doesn't exactly read like a Trump manifesto, does it? In the aftermath of the presidential election, with the fires of resentment still boiling, the group wrote on its Facebook page "we'll just take our legal weed and go." Such rhetoric no doubt places them firmly in Mr Trump's "bad dudes" category." The group's popularity has dimmed since November, yet it still boasts 8,000 volunteers, suggesting it remains a fulcrum of the Calexit movement. There has even been talk that Marinelli is being backed by the Kremlin (although, given all the talk about Donald Trump and Russia, there might be a joke in here somewhere). All of which could spell trouble for anyone who wants to hijack the independence bandwagon, and twist California to the right rather than the left. Nigel Farage and Arron Banks have proved themselves remarkably canny operators over the past year. They backed not one winning horse, but two, and turned overwhelming scorn and cynicism into the sort of against-the-odds political success not seen in Britain - or America, for that matter - in years. But if they think their idea of a two-state solution will be welcomed with open arms, their political antenna may for once have picked up the wrong signal.